Contributed by Anna Ryan, Jul 28, 2001 [annaryan001@hotmail.com]. Total records = 123. 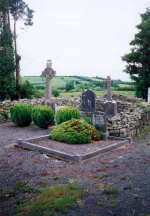 To reach the cemetery, take the Virginia to Bailieborough Rd. You will find it signposted. I walked this cemetery in the summer of 2001. McNally, Vincent, d. 16 Nov 1971, Son of Anne and Edward, "The Palms, Virginia"
Osborne Smyth, Ann, d. ? Osborne Smyth, Matthew, d. ?